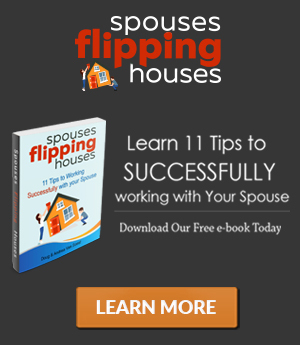 Doug: Welcome back to the Spouses Flipping Houses Podcast, Episode number 37 today. Welcome back. Andrea: Today we are talking about five reasons why every house flipper should have rental properties. Doug: Yes, but this is a house flipping podcast. It’s about flipping houses, not rentals. Andrea: Yes, but we like rentals. Doug: It is. Actually, it’s more about real estate investing, so we’re going to talk a little about the differences there and why every house flippers should have rental properties (we believe). But before we get into that, if you missed last week’s episode, I would encourage you to go check that out, Episode 36. Our good buddy Dave is doing his first flip in Hawaii, and he had a bunch of good questions from a first time flipper that we addressed in last week’s episode, so go check that one out if you haven’t heard it. What’s been happening in our business this week? Andrea: A lot. I’ve been running around like a chicken with my head cut off getting bids on different projects that we’re starting up. Doug: I’m just picturing this chicken with no head. I don’t now. I usually don’t do that. Andrea: That’s how I feel, like I’m bumping into things and running around like crazy. But anyways, it’s all good stuff though trying to get bids and get rehab projects started. And we had this one that we just bought out in the LA area, and so we don’t have contractors out there that we work with on a regular basis, so we’ve been trying to get referrals and get this project going. Well, the interesting thing is that we bought it from this guy, and his neighbor really wanted to buy the house too actually. So he gave his neighbor a shot, and he couldn’t qualify. It didn’t work out. So the neighbor was mad. So we show up; this guy has already moved out of state, and he says, “Go get the keys from the neighbor. I left the keys with the neighbor.” So we show up saying, “Hi. We bought the house. Can we have the keys?” And he’s refusing to give us the keys. Doug: Yeah, and we had called three or four times. He wouldn’t return messages, and then when we got there he’s claiming that no one has reached out to me. I don’t know who you are. I’m not going to give you keys, so he’s just being difficult. Andrea: Just being tough. And no big deal; obviously we changed the locks, and it’s no big deal. But we still have to run a rehab project next door to this guy who’s kind of being a stinker. So I showed up again to meet another contractor, and they intentionally opened their front door with their pit-bull dogs barking really loud. Just to let me know that they’re there. Doug: We’re here, and we disapprove. Our dogs disapprove of you too. Yeah in this business you deal with all kinds of stuff, and sometimes you don’t know what neighbors you’re getting when you buy a house. You can do the best investigation you can before you buy a home, and you should. But sometimes you might get a difficult neighbor that parties all day long and is super loud, and you just kind of half to work with that and deal with it. Andrea: Yeah, and that’s the thing is that both times that I showed up in the middle of the day, they’re all home, hanging out in the backyard. Doug: Yeah wasn’t there like a horseshoe game going on back there, and lots of beer, and stuff like that? Andrea: Yeah, so that could be a little bit of an issue on resale if the people don’t want to live next door to that. Doug: It could, yeah we hope it won’t, but you have to deal with that sometimes. So enough of that; let’s get into the main topic today. And that is five reasons why we believe every house flipper should also have rental properties. Andrea: Yes, this is 100 percent opinion. Andrea: This is totally just how we feel. We know some other very successful house flippers that disagree, but we’re going to tell you why we feel like this is really important. Doug: So we were inspired to do this episode recently at one of our investor lunch meetings that we attend. We attend a monthly meeting with a bunch of seasoned investors that have been in the business for a lot of years and have seen market cycles come and go. Now everybody around the table flips properties too. But, the point was that we’ve got an investment that is continuing to pay us monthly, so we’re not as impacted by the ups and downs of finding the next deal, and flipping the next house, and depending on that for income. Andrea: It seems like a lot of the people that were crushed in the last downturn maybe did not have a rental portfolio to fall back on as income, so when the market shifted and they don’t have flip income anymore, they had to go back to work somewhere else. Doug; Yeah do something else, because the money dried up for them. So we wanted to talk about the importance of investing and investing versus flipping. So house flippers, I mean we call it real estate investing when you’re flipping houses, but really it’s a business. You’re running a business. It’s sort of a job you’ve created for yourself or a few people around you to make income. And we’re not poo-pooing it at all because we do it, and we love it, and it’s a great business to make good money, so we really enjoy that. Andrea: It’s actually a tool for us to buy rental properties and to eventually get them paid off, and so we wouldn’t have a rental portfolio if we were not house flippers. Doug: Very true. Yeah, it has provided our income and the ability to buy rental properties. But we want to focus today on the true investing side of real estate, which would be picking up cash flow rentals and holding them for the long term. Our friend, Mike Cantu, who’s been on this podcast and who has a great portfolio of rental properties he’s built up over the years, was on a panel at a real estate investing meeting back in 2007/2008 when the market crashed, and everybody was scrambling to find deals to be able to flip properties. So, drop the mic. The point there is he’s comfortable; he’s got rental income. It doesn’t matter what the market is doing. If he doesn’t want to work 110 percent, 20 hours a day to try to find a deal at that point in time, he doesn’t have to because he has rental income. So we’re going to talk about that today because I think that’s very important. Andrea: Yes, so five reasons why every house flipper should have rental properties. Reason number one: flipping a property can pay you one time, but rental properties will pay you for a lifetime. Doug: Absolutely. The right rental property will continue to pay you and your heirs for as long as you own that property. You may make $15/20/30/50,000 on flipping a property, but if you count up the rental income month, after month, after month for years, and years, and years, you can far surpass that income by flipping a house, typically. Andrea: We sort of look at it like flippers as hamsters on a wheel, just constantly running, and running, and running. But it’s hard to ever jump off that wheel if you don’t have rental properties. So for us, we feel like rental properties are our way off the hamster wheel someday; whenever we choose to really. Doug: So the idea is a rental property will give you ongoing passive income that can be there for as long as you need it to be. Andrea: Okay, reason number two why we think you should own rental properties is that the real estate market appreciates over time, generally. Doug: Yes, generally. Now markets go up and down. Obviously those of us who have been in the industry in the past ten years know this very well, but if you look at the long-term trend for almost any market, it’s a slow gradual climb up. Real estate appreciates. It’s an asset that appreciates and when you buy rental property, it’s not a short-term thing. You’re thinking generally longer term. 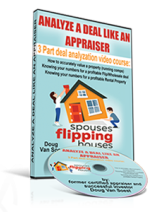 So that asset will gain value over time and when you own multiple rental properties, they’re all typically gaining appreciation over time. Andrea: So if you buy it correctly and it’s cash-flowing from day one, then if the real estate market does take a dip and prices do drop, you’re going to be okay because your property is still giving off that cash flow. Andrea: Reason number three, and this is probably one of my favorites, is that you can use leverage to acquire these properties. Doug: Yes, very good point. So Andrea, if you wanted to go buy a bunch of stocks at the stock market, could you go to the bank and say, “Hey, can you lend me 80 percent on these stocks so I can buy some stocks today?” What would they do? Doug: I don’t think so. I doubt it. You know, I’ve never tried that, but I doubt that would work. But the cool thing is you can leverage. You can use borrowed money to buy real estate, and interest rates right now are unbelievable, market lows, historic lows. So I’ve heard people say that this is the deal of a lifetime right now, just with the interest rates where they are. So let me give you an example of the power of leverage. So let’s say you have $10,000 to invest in real estate, and you use leverage to borrow $90,000 from a bank. So combining what you’re paying down and the $90,000, you’re buying a $100,000 asset of real estate. So we’re going to assume that each year for the next ten years, your property appreciates by five percent. And here’s the cool thing: you invested $10,000, but the entire $100,000 asset appreciates. So you’re getting to enjoy the benefit of the appreciation on the entire asset when you only paid ten percent on it. So it’s just really, really, really powerful to be able to leverage your investments that way. Andrea: So the one word of caution that we would give is to not over-leverage your properties. We saw a lot of people get themselves in trouble over-leveraging their properties at the peak of the market. And then prices declined, and they didn’t really cash flow from the beginning anyways and ended up losing them all. We saw that happen to a lot of people. So if you’re not sure how to know if a property will be cash flowing or not, you can go back and listen to Episode 10. We talk all about the ins and outs of cash flow, and what it truly actually means for a property to be positive. Doug: Yeah, good point. Definitely know your numbers there on a cash flow property. Alright, number four. Andrea: Number four reason why every house flipper should have rental properties is that your tenants will pay off your mortgage. Doug: I love this one. So all of this mortgage stuff we just talked about, guess what? When you’re renting it, your tenants are essentially paying that for you. So I mean, this is beautiful. This is a beautiful investment strategy. I mean what other investment can you purchase using other people’s money, then have other people pay that money back for you, and then you end up with an asset that has appreciated in value over that time? I mean it’s just incredible. Andrea: Reason number five why every house flipper should have rental properties is the huge tax advantages. Doug: Yes, taxes are boring. We know, but if you’re a house flipper, you are subject to what’s called ‘short-term capital gains tax’ in addition to the normal income tax that you would get off of those properties. And that’s just you know, God Bless America. We have to pay taxes here for all of the things that we enjoy. And they’re pretty high on short-term capital gains. But when you own a rental property, if you own any kind of investment for a year or longer, the tax varies based the tax bracket you’re in in different states, but it’s going to be significantly less gains taxes if you ever sell that investment. If you never sell it, guess what? You’re really not paying taxes on it. You can do other things; exchange that investment. There’s a lot of other strategies, but another benefit is you get to write off a lot. So let’s say you do have a mortgage on the property; you get to write off the insurance, the interest that you paid on that mortgage. You get to write that off. And then there’s this thing called depreciation that saves you even more money on your taxes, so those are just multiple, multiple tax benefits to owning long-term cash flowing rentals. Andrea: So that’s it. Those are our five reasons why we feel like every house flipper should have rental properties, and this isn’t really new information. You’ve probably heard everything that we’ve just said. But we really want to encourage people to think for the long term. And be a house flipper; it’s awesome. Making those big checks every once in a while is really exciting, but don’t forget to set some of that aside for your future. Invest in something passive. Doug: Absolutely. Well said, well said. And that wraps it up for today. We’re going to head out of here, but we wanted to encourage you if you haven’t yet to leave us a rating and review on iTunes. Please do that. We love it when people leave us a review. Andrea: Talk to you next week! This is a great article for people willing to take the leap into real estate investing. I’m a property manager located in Atlanta ( https://aramisrealty.com/ ) and these are some of the main points I always try to get across to people thinking about taking the plunge. Doug & Andrea, I became a manager after seeing there was a huge need. I first invested in rental properties on my own so that I can reach financial freedom. As experts in the field, what do you think holds back property owners from working with a property manager? A bit off topic but your insights would be great to hear. I believe that anyone looking to reach financial freedom in this domain needs to scale and the best way to do so is to hire a manager to help you out. I just find that those who have one property are always held back thinking that the cost is too great. It’s a really helpful tips on Rental Properties. As a home flipper or home buyer we always follow that steps which was mentioned in your article. Thanks for sharing with us. It can help people who are preparing rental properties.